It's easiest to see how GSuite supports the Engineering Design Process by using an actual design challenge. Let's take the simple act of building and optimizing a paper airplane for the longest flight possible using only the materials provided. You can join my Google Classroom with all the example assignment files here. The class code is ss9zv2w. Students start by using Docs to clearly define the problem they're attempting to solve. In this challenge, a lot of students will leave out the constraint that they can only use the materials provided to them. It's important to push students to have a clear and detailed problem definition before they start designing. Then, students work with their groups to brainstorm ideas they'd like to include in their design. As they do this, they're activating their prior knowledge and what they already know about airplane design before moving into research. After exhausting what they already know, students use the "Explore" feature in Docs to drag-and-drop images, websites, and other resources to help inspire their possible designs. Finally, students work together to decide what aspects of their brainstorming they want to use in their prototype. Prototypes can be built virtually or by hand. In the case of this challenge, it's probably not necessary to spend a lot of time in SketchUp, since paper airplanes can be prototyped pretty quickly. However, if you're interested in students doing some 3D modeling work, they can start with 3D Warehouse, which is Sketchup's 3D object repository. A simple search for "paper airplanes" will bring up several 3D models that students can rotate and explore. If you'd like, groups can then work on their own designs in SketchUp, download the file (.skp), then upload it as an attachment in Google Classroom. Once plans are made and prototypes are built, it's time to test. Groups will launch their planes multiple times, make modifications between each throw, then track their data in a shared Google Sheet. This particular spreadsheet has a bit of conditional formatting to help them quickly see if their modifications improve their flight distance (or not). After their first round of test flights, students will answer the questions in a short Google Form about what worked to improve their flight distance. In the Google Classroom I set up for this challenge, I gave all students access to the "Responses" spreadsheet so they can learn from the experiences of the groups around them. Once they've reflected on their flight data and the Form responses, it's up to you and the time constraints of your classroom as to whether or not students will take another round of test flights to further optimize their airplane design. When all the testing is complete and each group is satisfied with their design, it's time to share. Groups will use a shared Slides presentation and add their flight distance data and reflections on their slide. They can capture images of their airplane using the "Insert > Image > Take a Snapshot" tool. After each group has their slide completed, it's easy to share their results with the class efficiently so everyone benefits from the experience. At the end of the day, it will always be true that it's not about the tool, it's what you do with it. 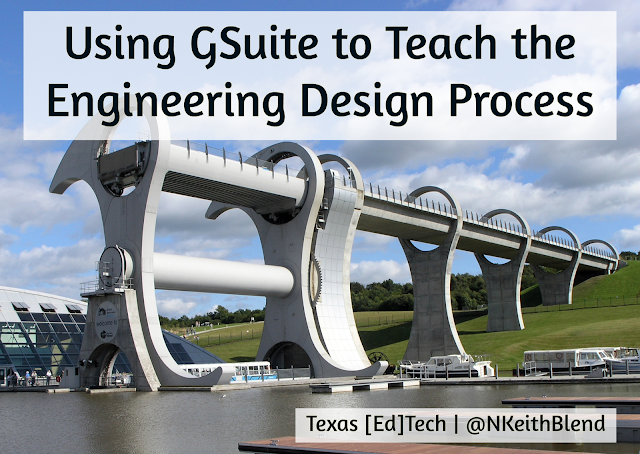 Using GSuite to support design thinking and the engineering design process encourages students to find multiple ways to solve a problem, test and optimize their designs, then share their results with those around them. Because no matter what our students go on to do, that's a skill set every one of them will need for the future.